McCormick earnings for the company’s fiscal first quarter of 2019 has MKC stock up on Tuesday. McCormick (NYSE:MKC) reported earnings per share of $1.12 for its fiscal first quarter of 2019. This is an increase over its earnings per share of $1.00 reported in the same period of the year prior. It was also good news for MKC stock by beating out Wall Street’s earnings per share estimate of $1.03 for the quarter. The McCormick earnings report for the company’s fiscal first quarter of the year also includes net income of $148.00 million. This is up slightly from the company’s net income of $422.60 million reported in its fiscal first quarter of 2018. McCormick earnings for its fiscal first quarter of 2019 has operating income coming in at $196.90 million. The maker of spices, seasonings and condiments reported operating income of $181.10 million during the same time last year. Revenue reported by McCormick for its fiscal first quarter of the year comes in at $1.23 billion. This is up slightly from its revenue of $1.22 billion reported in in its fiscal first quarter of the previous year. However, it does come in below analysts’ revenue estimate of $1.24 billion for the period, but wasn’t keeping MKC stock down today. 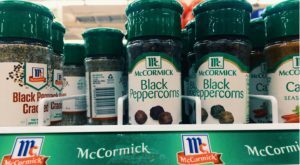 The most recent McCormick earnings report also has the company taking time to reiterate its outlook for fiscal 2019. It is still expecting earnings per share for the year to range from $5.17 to $5.27. Wall Street is looking for earnings per share of $5.22 for the fiscal year. MKC stock was up 1% as Tuesday afternoon. Article printed from InvestorPlace Media, https://investorplace.com/2019/03/mccormick-earnings-up-mkc-stock/.